Introducing the NEW Tuscan Arch front for the QFI35FB-C and QFI30FB-C Firebrick gas inserts! Available in black and sienna bronze, these fronts will replace the Tuscan Bar front and maintain the same heavy-duty feel and arch at a lower price, allowing for more consumers to upgrade to the front they really want. Based on your feedback, Quadra-Fire has improved the side panels on the Adventure II and III, making them easier to remove when servicing thermocouples and tubes. This change will also help to reduce metal expansion noises. This change is effective on all appliances starting with the following serial numbers: Adventure III # 00900200544; Adventure II # 00900100626. The new side panels will work on old appliances and the part number has stayed the same. The Longmire offers the nostalgic wood-burning fireplace sights, sounds and smells you love in a linear shape. Sleek hideaway glass and screen doors are neatly tucked away to reveal a roaring fire. Finish available in stainless steel or black (indoor unit only). Click here to see how beautifully the Longmire burns, a demonstration of these features and more! Harman is always looking at ways to refresh our pellet stoves with innovative new looks and features. 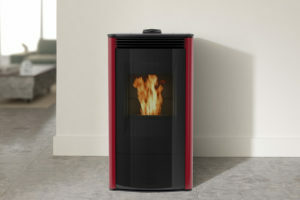 Take a minute to watch this refresher on the features of the stylish, powerful, quiet and EASY Allure50 Pellet Stove!